Global Pressure Sensitive Tapes & Labels Market Size was estimated close to USD 90 billion in 2016 and will exhibit growth by a CAGR of over 6.5% up to 2024. The proliferation of packaging industry will be a chief growth enabler for the pressure sensitive tapes & labels market. Increasing levels of international trade coupled with a growing need for packaging materials will fuel product demand in the next seven years. Pressure sensitive tapes & labels are continuous flexible strips of plastic, paper, metal, cloth or other materials coated with an adhesive which will stick to a variety of surfaces at room temperature and with light application of pressure without the need for any phase change. The chief applications of these products include bonding, packaging, sealing, masking, and labelling. The rising demand for these products in a wide range of high growth industries such as electronics, automotive, construction, packaging, etc. will augment the pressure sensitive tapes & labels market during the forecast years. Asia Pacific packaging industry has been experiencing high growth in the last two decades with China, India, Indonesia, Thailand, and Singapore being the most significant contributors towards this growth. The Chinese packaging industry will grow by more than 5% till 2024 and is likely to replace the U.S. as the largest packaging market by the end of 2020. India is one of the fastest growing packaging markets in the world with a revenue exceeding 40 billion in 2016. This will propel product demand for use in packaging applications during the forecast years. Moreover, developments in the flexible packaging industry coupled with rising demand for corrugated box packaging will drive the pressure sensitive tapes & labels consumption for wrapping and labelling applications. Environmental concerns related to adhesives used in the pressure sensitive tapes & labels will be the major restraining factor for the industry. The earliest adhesives used in these products including rosins and low-viscosity natural rubber were coated from solvents such as toluene, xylene, aliphatic hydrocarbons, etc. Without proper containment these solvents were simply disposed into the atmosphere. The high amount of energy needed to evaporate these solvents also resulted in the emission of greenhouse gases. Such environmental concerns led to the adoption of hot melt pressure sensitive adhesives which are low polluting in nature. However, inadequacies in low polluting adhesives, such as higher application temperature, low holding power, etc. are a major source of concern for industry participants. These factors coupled with stricter regulations regarding solid waste disposable may hinder the pressure sensitive tapes & labels market growth. 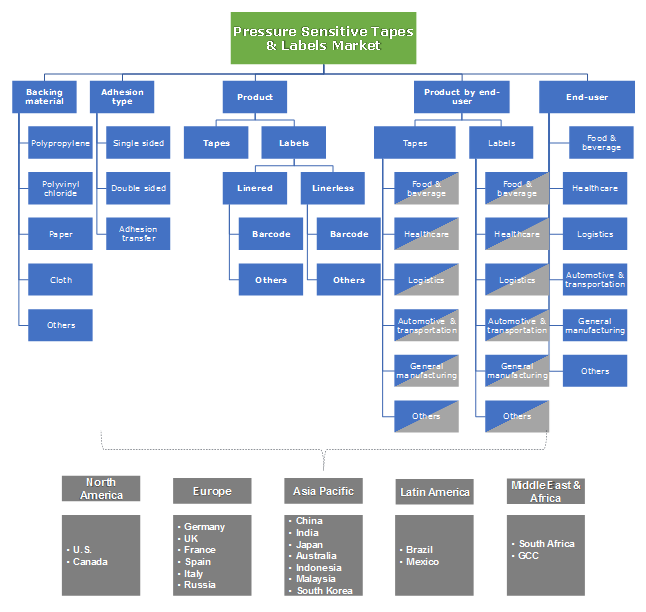 The global pressure sensitive tapes & labels market is segmented, based on backing material, into polypropylene, polyvinyl chloride, paper, cloth and others including metal foil, foam, polyethylene, etc. Polypropylene segment held the largest market share in 2016 and will hold sway during the forecast years. Its growth will be augmented by polypropylene’s superior moisture and chemical resistant properties. Good fatigue and impact resistance along with its resistance to electricity also significantly increases its demand as a backing material. Polyvinyl chloride segment will gain by more than 6% CAGR during the forecast years. Its demand as a backing material is chiefly propelled by its characteristics such as superior gloss and clarity, easy machinability, relatively lower costs, higher mechanical strength, and abrasion resistance. This segment registered a revenue exceeding USD 4 billion in 2016. According to adhesion type, the pressure sensitive tapes & labels market is segmented into single sided, double sided, and adhesive transfer type. In a single sided adhesion type product, an adhesive is applied to the backing material on only one side. Electrical, carton sealing, masking and medical tapes are some examples of single sided pressure sensitive tapes. Single sided segment accounted for more than three-fourth of the entire market in 2016 gaining with a CAGR of more than 6.5%. Adhesive transfer product type includes release liners coated with adhesives on both sides. For application, the tape is pressed on the surface with the adhesive side down and the liner is peeled off, leaving the other adhesive coated layer exposed for further bonding. Acrylic adhesives are commonly used for these kinds of products. The segment’s revenue in 2016 crossed USD 15 billion and will gain by a moderate rate in the forecast years. The industry is bifurcated, according to products, into tapes and labels. Tapes held the majority of the market share in 2016 which will hold sway during the forecast years. The segment will exhibit a growth by more than 6.5% CAGR and this growth will be majorly driven by the product’s usage in several end-user industries such as automotive, construction, electronics, etc. Labels can be of a variety of materials and contains written or printed information about the product or item that it is affixed to. Labels product segment will gain by a high growth rate during the forecast years, mostly due to the rising consumption of FMCG and food & beverage products. 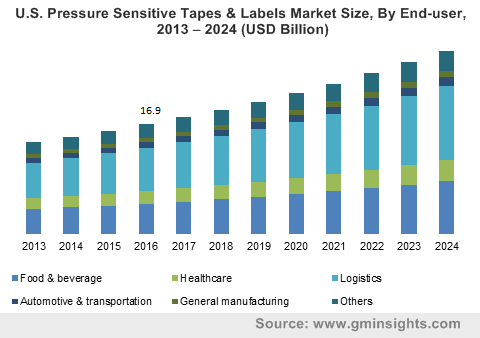 The pressure sensitive tapes & labels market is segmented, according to end-user industries, into food & beverage, healthcare, logistics, automotive & transportation, general manufacturing, and others such as building & construction, office & household, etc. Logistics is a major end-user segment accounting for more than one-fourth of the industry size. This segment includes pressure sensitive tapes & labels used for the packaging of a wide range of products such as consumer goods, household items, etc. The segment will grow by a CAGR of more than 7% during the forecast period. Healthcare is also a significant end-user in the pressure sensitive tapes & labels market which will grow by a moderate CAGR during the forecast years. The product has many uses in the healthcare industry including surgical applications, wound care, medical device assemblies, ostomy, diagnostics, and electro medical. This segment earned a revenue of over USD 8 billion in 2016. Asia Pacific is the largest pressure sensitive tapes & labels market which will gain by more than 7% CAGR during the forecast period. High growth in the packaging industry in the region coupled with rising demand for food & beverage products will be the chief reason behind the region’s high share. Increasing automotive production in Asia Pacific along with a robust growth in the industrial manufacturing sector will augment the regional market. Europe is also a key regional pressure sensitive tapes & labels market which held more than 20% share of the overall industry in 2016. Increasing construction activities in the Eastern European countries and rising manufacturing activities in Germany, France, and UK will propel the product market growth in the region. The major industry participants in the pressure sensitive tapes & labels market are Avery Dennison Corporation, 3M, Scapa Group, Berry Global Inc., American Biltrite Inc., DeWAL, Gaska Tape Inc., LINTEC Corporation, MACtac, CCL Industries, Constantia Flexibles, COVERIS, Inland, Fuji Seal International, Inc., UPM Raflatac, and others. Manufacturers are using strategies such as mergers and acquisitions along with research & development initiatives to increase their industry presence and enhance their product portfolio. Pressure sensitive tapes & labels have been experiencing increasing demand owing to their ease of application and handling. Their superior bonding properties have enabled their usage in a large number of manufacturing industries where they are slowly substituting conventional bonding materials and techniques. Their usage as masking and sealing materials along with application in the healthcare industry will augment the global pressure sensitive tapes & labels market during the forecast years.